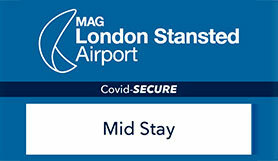 Closeness and security - those are the things you want from a relationship, and those are the things you'll get if you park at Stansted Airport Parking Mid Stay. Low floors on the transfer buses make access easy for disabled passengers. The car park has disabled toilets and disabled parking bays and the transfer buses have low floors. You need to give us your car registration number either when you book, or sometime before you go. It needs to be the right one - if you change the car you're going to be travelling in, you need to give us the new details. The car park has automatic number plate recognition (ANPR) - so make sure you give us the correct car registration number when you book. You should bring a copy of your booking confirmation to the car park with you. The barrier will lift automatically when it recognises your number plate. This should take about 15 seconds. It will give you a ticket with your registration number on - keep this ticket, as you'll need it to get out of the car park. Then just park your car and wait for the transfer bus to the terminal. If the barrier doesn't lift or give you a ticket, press the help button. Follow the road for just over 1 mile and take the Stansted Airport exit. Branch left, and then at Bassingbourn roundabout take the third exit following signs to Mid Stay car park at the next roundabout take the first exit. The Mid Stay car park is situated immediately in front.